The nations that drafted the UN Charter in 1945 clearly were more concerned about peace than about justice. As a result, the Charter prohibits all use of force by states except in the event of an armed attack or when authorised by the Security Council. This arrangement has only very imperfectly withstood the test of time and changing world conditions. In requiring states not to use force in self-defence until after they had become the object of an actual armed attack, the Charter failed to address a growing phenomenon of clandestine subversion and of instantaneous nuclear threats. Fortunately although the Charter is very hard to amend, the drafters did agree that it should be interpreted flexibly by the United Nations' principal political institutions. In this way the norms governing use of force in international affairs have been adapted to meet changing circumstances and new challenges. The book also relates these changes in law and practice to changing public values pertaining to the balance between maintaining peace and promoting justice. Part I. The United Nations' capacity for adapting to radical changes of circumstance ; Part II. 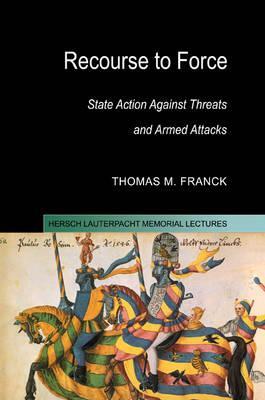 Use of force by the United Nations; Part III. The original parameters of self-defence; Part IV. Self-defence against state-sponsored terrorists and infiltrators; Part V. Self-defence against ideological subversion; Part VI. Self-defence against attacks on citizens abroad; Part VII. Anticipatory self-defence; Part VIII. Countermeasures and self-help; Part IX. The 'purely humanitarian' intervention; Part X. What, eat the cabin boy? Uses of force that are illegal but justifiable; Index. "This is a book that will inform, captivate, and challenge generations of international lawyers, on several levels and in a variety of ways."